Sydney Theatre Company and The Australian Defence Force present THE LONG WAY HOME by Daniel Keene at the Sydney Theatre. I am sitting in a small room in a special wing of a private hospital in Melbourne. It's a psychiatric ward. The nurses tell me when to shower and when to eat and they watch me as I take my medication. In the corridor a bedraggled woman, a fellow patient, tells me casually that she likes to cut herself--I've no idea how to respond. I'm told I'll be here for a week. My overwhelming thoughts are that I shouldn't be here--I am a serving major general in the Australian Army. Generals are meant to be strong, to lead by example--they aren't paid to sit around in psychiatric wards. Not so long ago I was in charge of 1,500 Australian troops in Afghanistan and a thousand more in the wider region. Now, the only thing I'm able to manage on my own is a trip to the bathroom. This is my story, but it is also the story of thousands of Australian veterans--from Iraq, East Timor, Afghanistan and other conflicts--who carry similar emotional scars. Men and women whom we send off to war, largely ignore while they are there and who are too easily forgotten once they are home." These words are from EXIT WOUNDS. One Australian's War on Terror, written by an Australian veteran, Major General John Cantwell, with Greg Bearup, published in 2012. Said Air Chief Marshall Angus Houston AC, AFC (Ret'd) in response to this book: "John Cantwell has always led from the front. In bravely detailing his struggle with post-traumatic stress disorder, John is helping to break down any remaining stigma associated with the disorder. The positive impact John's personal story will have on those in the military dealing with similar experiences cannot be overstated, not to mention the contribution it makes to community understanding." Was this the source of the puzzling, difficult behaviour of my Uncle 'Bonzer' - real name Clive - a veteran from the campaign in New Guinea in the Second World War? Even of my dad, who when asked "What did you do in the war, dad?" would reply to us kids, "Cleaned the latrines." He laughed. We laughed. He was in the navy, we never learnt anything else. Friends of mine drafted and who served and returned from Vietnam, too, were reticent. EXIT WOUNDS, and now THE LONG WAY HOME, presently, have helped the 'community' (me), has given us an aid to understand, why was this so. John Cantwell and the soldiers involved in this project, 'heroes' again. 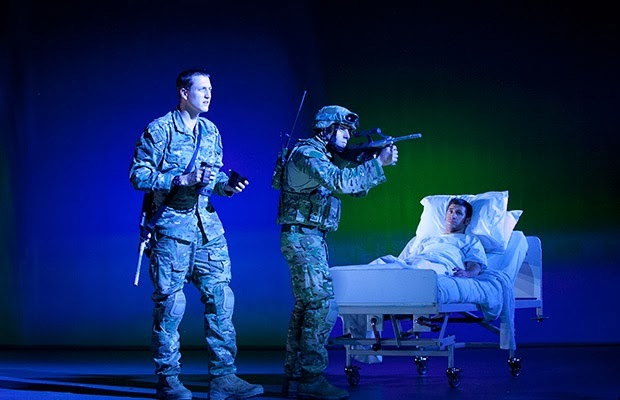 THE LONG WAY HOME was initiated after the encounter that General David Hurley (Chief of the Australian Defence Force - ADF) had, seeing a British play, THE TWO WORLDS OF CHARLIE F, at the Theatre Royal Haymarket, in London, created by Bravo 22 Company, in 2012. Perhaps, the example, too, from the courage of his fellow officer, John Cantwell. It was a play using the experiences of soldier veterans preparing, engaging and returning from war, performed by the actual soldiers. The theatre of war that the soldiers had participated in was in Afghanistan. General Hurley was profoundly moved, and understood that, perhaps, a similar project, in Australia might be useful. Contacting the Sydney Theatre Company (STC), it came quickly on board. The British Director, who had brought the THE TWO WORLDS OF CHARLIE F project to fruition, Stephen Rayne, was invited to take charge of the process here, and after engaging Australian writer, Daniel Keene, to collate and write a text, a reconnoitring with returned Australian Army personnel began, to find those soldiers who would be willing to reveal and explore, in a 'workshop' situation, their freely chosen vocation, and its consequences, acknowledging a need to confront and deal with the "I am my job" truths. A five week workshop began in the STC studios in September, 2013, and not only were the stories found, but also the soldiers (with some professional actors), learnt some of the basics of acting and improvisation. In less than a year the 'fruits' of this exercise has arrived in the Sydney Theatre, to be followed, with an extensive tour, around Australia over the next several months. The craft of acting requires a myriad of demands to successfully tell other people's stories convincingly, and the key one, I believe, is PERSONALISATION. It is a necessary process for any actor in any role, he/she is exploring, to find an identification of a recognised (personalised) recall from one's own life (this can be both first-hand and second-hand; conscious and unconscious), so that one can, confidently, truthfully, 'speak' and 'do' the demands of the writer. They must believe, for the audience to believe, that they are the 'life' force of the person that they are 'playing'. To do that well, one must use one's own life experiences as a starting point. The major 'trick' for the actor is to have the COURAGE to REVEAL those similarities, and with the gift of imagination, USE them to tell the story. Acting is not an escape (a pretending) from your life issues but a revelation (reveal) of them. It is a huge and always difficult task, but a necessary one, and all artists succeed at varying capacities from role to role to achieve it. Acting is no picnic for those at the upper echelons of excellence - it is personally, costly, and is one of the great and highly prized, much sort after, 'mysteries', of the craft. The craft of acting, then, is, has been described by some, as a 'kind of therapy' (but definitely not therapy in the conventional sense of the word) - psychotherapists may employ psycho-drama role play 'games' to assist their patients to healthier ways of living with their choices. Actors use psycho-drama and role play to find the deeper 'truths' of their 'choices' for their characters. Years ago I discovered those tools used by the followers of Freud and his 'apostles', were similar to those of Stanislavsky and the 'apostles' that followed him. One set of skills for life development, the other for craft and art development. THE LONG WAY HOME, then, is a tool for the participants, both soldiers and actors to engage in truths and use them courageously to tell stories convincingly for an audience (if one casts one's memory back the Timberlake Wertenbaker play OUR COUNTRY'S GOOD, revealed the power of acting, of the theatre, as a tool for healthful developments - it changing the lives of exiled criminals of the Sydney Penal Colony under Governor Philip). The aim of performance is to give an audience a catharsis in the experience of what they witness through the skill and courage of the storytellers who appear to be meaning what they say and what they do - telling truths. Whether the soldiers, performing in THE LONG WAY HOME were all convincing actors or not, and there were many who were, the overwhelming authenticity of what we were hearing, watching, witnessing , embodied and emboldened by all these performers, was the clincher to have me surrender to the play (and this was the key element absent from the recent Queensland Theatre Company production of BLACK DIGGERS). The gathering power of this production climaxed in the curtain call, where the palpable gratification and sense of pride in a job well done, emanated from all of the 'actors'. The modest, slightly embarrassed appreciation by the 'actors', on the stage, to the audiences' applause was moving, and a sure sign, to me, that this project was a worthwhile event for more than just art, its ramifications seemed to be a life enhancing, confirming one, for both the soldier-actors and its audience. There were many in the audience who had recognised their own experiences on the stage, for there were pockets of response that indicated a privilege of a 'knowing' that those of us outside that world of the play, in our life living, did not have - subtleties (codes) of humour and emotions that belonged only to them - and there was a kind of relief, physical relaxations of held tensions, visible in the response to their recognitions of them. (N.B that there has been, from some, a negative response to the writing or performance of the two Officer "Stiffy" satiric monologues, for instance, and other of the comedy, which seemed, from the other side in the audience, of the 'knowing', to strike huge chords of recognition and appreciation - a case where dramaturgy was, and should be, trumped by a less neat exposure of necessary truths). THE LONG WAY HOME is a point where health and art craft crossed paths, triumphantly. This healthful experience was something I had experienced, at a concert of Wynton Marsalis' BLOOD ON THE FIELDS (1997); August Wilsons' JOE TURNER'S COME AND GONE (1988), both in San Francisco, and both with a 90% or more, African-American audience - that had the joy of seeing and hearing themselves in a very public 'forum', and relishing the relief and comfort of that - and, so it was, at THE LONG WAY HOME for the actors and some of the audience, intensely, in the Sydney Theatre. In my estimation, besides the courage of the 'actors', it was the sensitive and skilful writing and dramaturgical structure of that writing, from the verbatim sources of the workshop, organised and developed by Daniel Keene, that sculpted the core of the production's success. This script of monologues, interacted scene naturalisms of dramatic import - in recruitment offices, in training activities, in the theatre of war and on their return to Australia - contrasted with comedy of a 'low' and 'high' kind that was of the 'folk' genealogy of this soldierly, 'masculine' world, with choreographic movement/staging that was emblematic of the dance of war and 'peace' and was easeful and intriguingly inviting. Images from Sam Mendes', JARHEAD (2005), Kathryn Bigelow's ,THE HURT LOCKER (2008) resonated back to me; beside the Documentary: RESTREPO (2010) - by Sebastian Junger and Tim Hetherington, and Mr Junger's book, WAR (2010), and the powerful recent novels, the first by Kevin Power, THE YELLOW BIRDS (2012), and Ben Fountains' BILLY LYNN'S LONG HALF TIME WALK (2012). I wondered what this play by Mr Keene might be with a full company of trained actors - and I reckon, it might be still impressive, in a different way, certainly, but still resonant. I was delighted when I read of the gifting of the commission of this project to Mr Keene - his two plays: CITIZENS and SOLDIERS that the STC presented as THE SERPENT'S TEETH in 2008 at the Drama Theatre was a qualification of empathy and proper insight enough for me, he had earned the privilege to continue his exploration of our cultural hidden tendernesses. One has waited for the recent Australian Military story to be told. Not just of the family goodbyes and returns with shinning and weeping wives and children, that we see on regular television news reports, not just that of the returned dead with governmental presences suitably awed in public ceremonies, but, especially of the returned veterans finding ways to survive and live in the contemporary world at home. I have had insights into the American and British experience of its veterans and the consequences at home, in their performing arts, but none at all of the Australian experience till THE LONG WAY HOME. Is this a beginning for our writers being able to access these important stories with ADF and Government openness and support? With this rich first hand source material, shaped so well by Mr Keene, the experienced work of the Director, Stephen Bayne, is apparent in the sureness of every choice he has made.The Design element created by Renee Mulder, an open stage supported with large projection screens to show videos and images and Brechtian-like titles is fluid and effective, all the action lit with tremendous dramatic effect by Damien Cooper, with an immersive Sound Composition and Design by Steve Francis, that energises and thrusts the audience into the events of the 'fields' of action in the play. The soldier actors are led impressively to communicate, relatively sophisticatedly. Tim Loch, Craig Hancock and James Whitney are standouts in the 'naked' courage of their storytelling - but, all give constant offers to allow the production to be held, by the audience, as a constantly occupying experience. The raw, heart knowledge of these people's lives are unforgettably memorable. Martin Harper, Takhi Saul, Warwick Young and, especially, Emma Jackson and Odile Le Clezio (as the 'wives' at home) are the professional actors who intermingle with the rest of this company to seamlessly tell, support the story of these men. This is not a verbatim experience, the dedication and experience of Mr Keene and Mr Bayne have created a dramatic play that more than usually, resonates from its heart, of its blood, and sweat, to a confronting level of painful truths about a 'terrible' part of our world at work. THE LONG WAY HOME, I hope, will not be the only modern story of Australians at war, but the first of as many as are necessary, including the stories of the 'collateral damage', of the civil and cultural casualties of the war zones, as well. The weights of the tragedy of war and its aftermaths in all of its reaching tentacles, for all involved, needs to be re-visited, sadly, often, to remind those of us safely at home, what the cost of such service is and question its efficacy to the human heart and soul. Australia has been at war for the last 20 years. The Afghanistan conflict, literally, over today - the 2nd March, 2014 - our troops marching in Darwin, on their return. A revival of Damien Millar's, THE MODERN INTERNATIONAL DEAD, premiered at the Griffin in 2008, should be given, for a larger audience, I reckon - a masterpiece? - I think so. I say, congratulations to all involved. A remarkable achievement in such a short time. Those of you who can should get down to Wollongong 5-8th March to witness it. For others, then, Townsville, Canberra, Melbourne, Adelaide, and finally, Perth from now through till April. Each destination, too briefly, but worth catching. DO. P.S. 1. The recent exhibition of Ben Quilty AFTER AFGHAISTAN, paintings made as the Official War Artist in 2011, at the National Art School Sydney worth looking up on-line. 2. Tricycle Theatre Company, in London, in 2009, presented (twice) THE GREAT GAME: AFGHANISTAN - 3 sets of four plays illustrating the first Anglo War in Afghanistan up to the present day. It has toured into the United States, even used by their Military Office, The Pentagon, as a tool to educate their soldiers. The writers that contributed were: Stephen Jeffreys, Ron Hutchinson, Amit Gupta, Joy Wilkinson, David Edgar, Lee Blessing, David Greig, Colin Teevan, Ben Ockrent, Abi Morgan, Richard Bean and Simon Stephens. Quite a line up. We haven't seen it. I can recommend it as a very good read - in fact, highly recommended. 1. Exit Wounds. One Australian's War on Terror by Major General John Cantwell with Greg Bearup. Melbourne University Press - 2012.